Food Hampers have always been a big hit amongst your friends and loved ones. 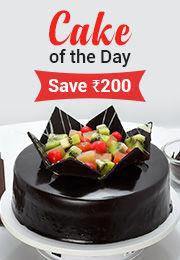 You can send Birthday food hampers to delight your loved ones with gifts which will make the occasion truly special. You can personalize the occasion with a message plaque to make them feel special on their birthday. Food hampers for birthday have a universal appeal because they have something for everyone. Birthday gift hampers are available in an exciting variety at Ferns N Petals. Tea or treat is an ideal hamper for afternoon tea. Treat your loved ones with a basket full of flavors from ferns n petals. Get a hamper of Tetley Masala Tea and Elaichi Tea, Taj Mahal Ginger Flavour Tea, Nestle Alpino chocolates online, Dukes Waffy in Strawberry, Chocolate and Pineapple flavor wafers each, Galaxy Crispy chocolate and Galaxy Caramel chocolates along with Galaxy Fruits & Nuts chocolates and Galaxy Smooth Milk chocolate beautifully placed in a basket. To add more to it, we have also included black ceramic coffee mugs to the deal. Blue without you mum is a mood fixer. An ode to the Mothers! Let your super Moms know that your world is Blue without them. Show your gratitude for your Mother with an amazing gift hamper of Twinings calming camomile, Bounty chocolates, heart shaped toys in shades of blue, mother special coffee mug, mother special table top memento and Danish Butter Cookies beautifully placed in a wooden tray from Ferns N Petals.